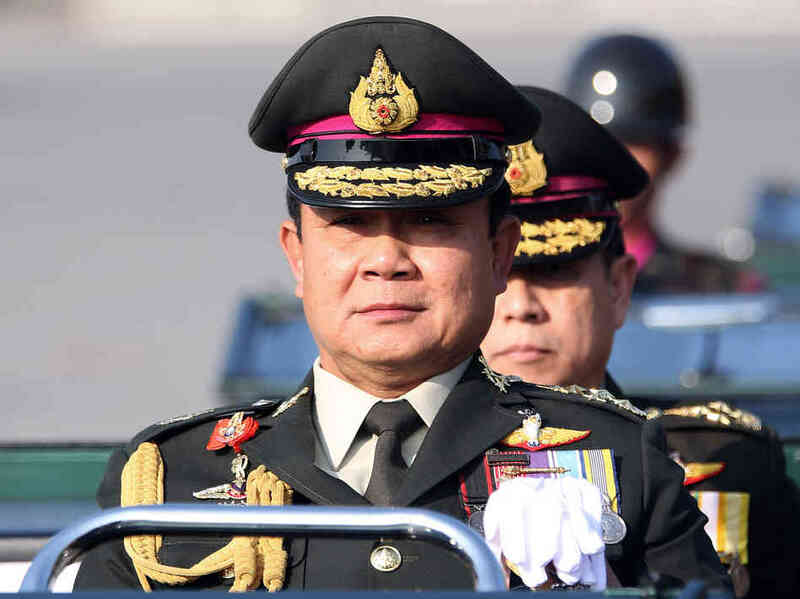 JNN 20 May 2014 BANGKOK—Thailand’s armed forces declared martial law early Tuesday, saying the move was intended to curb the country’s sometimes violent political conflict and wasn’t a coup d’état. Army chief Gen. Prayuth Chan-ocha issued a pair of statements at 3 a.m. and later appeared on television to say that martial law was necessary across the country to address the worsening security situation. The army later said it would censor media it deemed inflammatory. Thailand is bitterly divided between supporters of its populist government and its conservative opponents who have been massing on the streets for over half a year in a bid to topple the administration. Before Gen. Prayuth went on air, Army-run television station Channel 5 ran a ticker message across the bottom of its screen urging the public not to panic. The network also broadcast a series of patriotic ballads—in some cases with English subtitles—featuring scenes of soldiers doing good deeds, or declaring their love for their country, as troops stepped up their presence in the city. Soldiers appeared at key intersections and also mobilized outside some television stations. Some broadcasters showed troops inside network control rooms. In a statement later Tuesday, the army said it would prohibit the broadcast or publication of “distorting” information that could instigate public disorder or compromise security measures. The army said it ordered the suspension of 10 satellite television channels run by pro- and anti-government groups. Some analysts questioned whether the army’s maneuver foreshadowed more severe measures, such as the appointment of a new, interim government. Since the end of absolute monarchy in 1932, Thailand’s armed forces have staged 18 coups, most recently in 2006. So far, Thailand’s civilian leaders haven’t appeared in public or made any comment and their precise locations are unknown. They weren’t informed beforehand about the military’s plan to declare martial law, a Thai official said. Paul Chambers, a professor and military analyst at Thailand’s Chiang Mai University, said Thailand’s martial law act of 1914 provides the army with sweeping powers, effectively giving the army chief control of the kingdom without the assent of the prime minister. “Gen. Prayuth can now say he has not carried out a coup,” Mr. Chambers said, adding that the army chief could use the cover of the 1914 act as a means to bring in a ‘neutralist’ prime minister or step in himself. Over 24 people have been killed in political violence since the current wave of protests began in November, deepening the fissures in a country where the memory of the coup that removed former leader Thaksin Shinawatra from power in 2006 remains vivid. The crisis reached a fresh peak earlier this month when Thailand’s Constitutional Court removed Mr. Thaksin’s sister,Yingluck Shinawatra, from her post as the country’s prime minister for improperly removing a top bureaucrat after her election win in 2011, a move that exasperated many of her supporters. Anti Government protesters, meanwhile, are now attempting to remove the rest of her administration and install a new, unelected government to pursue a series of reforms. Acting Prime Minister Niwattumrong Boonsongpaisan has been working from a series of remote locations after protesters surrounded and then occupied parts of the main government complex amid the temples and monuments of Bangkok’s historic quarter. Mr. Niwattumrong didn’t immediately respond to requests for comment. Only junior officials have attended a meeting of government officials called by the army at one of its facilities in central Bangkok. The declaration of martial law effectively removes the government and the police from the process of enforcing the law in Thailand. In his statement, Gen. Prayuth said the army would take over the government’s special security command center—established last year to oversee the protests—and also ordered other security forces, including the police, to report to the army. He said the army has the authority to summon officials and individuals for investigation. So far, the government’s supporters appear to be taking a cautious view of the latest developments. A leader of the pro-government Red Shirt faction, which has been holding its own counter-demonstrations in a suburb of Bangkok, urged its followers to be patient and wait to see how the situation unfolds. “I’m asking our people not to panic, but say good morning to troops in a friendly way. Our intention to fight for the survival of this government hasn’t changed,” Jatuporn Prompan said in a Facebook post. Antigovernment protesters, meanwhile, said they would suspend their rallies for the time being. This entry was posted in Asia Pacific and tagged Coup de et at, Martial Law, Thailand. Bookmark the permalink.